In a school the periodical examination are held every second month. In a session during April 2001 - March 2002, a student of Class IX appeared for each of the periodical exams. 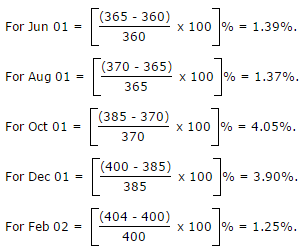 The aggregate marks obtained by him in each perodical exam are represented in the line-graph given below. 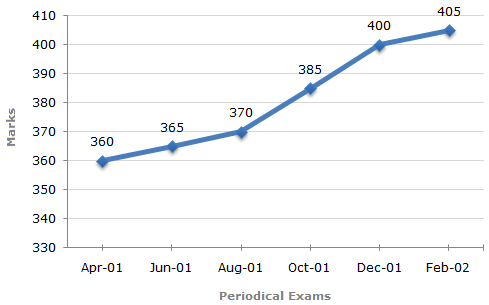 Marks Obtained by student in Six Periodical Held in Every Two Months During the Year in the Session 2001 - 2002. In which periodical exams did the student obtain the highest percentage increase in marks over the previous periodical exams? Clearly, highest percentage increase in marks is in Oct 01.